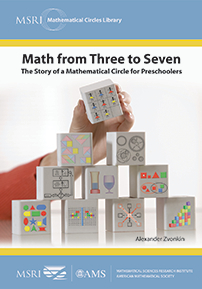 This book is a captivating account of a professional mathematician's experiences conducting a math circle for preschoolers in his apartment in Moscow in the 1980s. As anyone who has taught or raised young children knows, mathematical education for little kids is a real mystery. What are they capable of? What should they learn first? How hard should they work? Should they even “work” at all? Should we push them, or just let them be? There are no correct answers to these questions, and the author deals with them in classic math-circle style: he doesn't ask and then answer a question, but shows us a problem—be it mathematical or pedagogical—and describes to us what happened. His book is a narrative about what he did, what he tried, what worked, what failed, but most important, what the kids experienced. This book does not purport to show you how to create precocious high achievers. It is just one person's story about things he tried with a half-dozen young children. Mathematicians, psychologists, educators, parents, and everybody interested in the intellectual development in young children will find this book to be an invaluable, inspiring resource. Parents and teachers interested in working on math with young children.